Many of my friends and family from home have been asking me about what I usually do every day as a Peace Corps volunteer – which made me realize that I have been good at sharing snippets of my experience, but not really sharing the specific details of what my life looks like here. I work at a Municipality (local government) full time with a project team that is responsible for implementing an EU funded grant for regional tourism. As a volunteer, I can take on other projects as well…which in my case currently involves teaching English to municipal workers – and beginning a women’s yoga class at the local house of culture. I am so excited about kicking off the yoga class; I think that there is a growing shift in consciousness about health here, and while yoga classes are available in the capital, there are no resources in my town. It is difficult for many women here to find the time to exercise or to attend a class like this due to the many responsibilities that they have in the home and at work. Most women that are around my age are “nuse’s”, or new brides. The majority of them move into their husband’s household after marriage and become responsible for managing (or co-managing, with their sister-in-laws – and mother-in-laws, depending on how nice the mother-in-law is) the house – which means cooking all meals, entertaining guests, and keeping the home clean. This is on top of their jobs outside the home, which means that these are some very busy women. On a typical day, I will wake up at about seven a.m. to get to work at eight a.m. I greet the security guards of the Municipality in Albanian or Macedonian. I am perfectly fluent in greetings, it’s the next levels of conversations that are problematic! I settle in at the office and check my e-mail before joining a group of my female co-workers for our morning coffee. 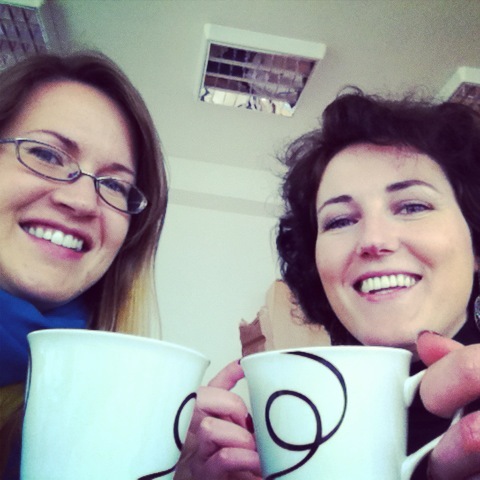 Below is a photo of one of my colleagues and I sipping a cup of delicious Turkish coffee. Coffee is made in every office using a small gas burner and finjan (the object you can see sitting on the burner). 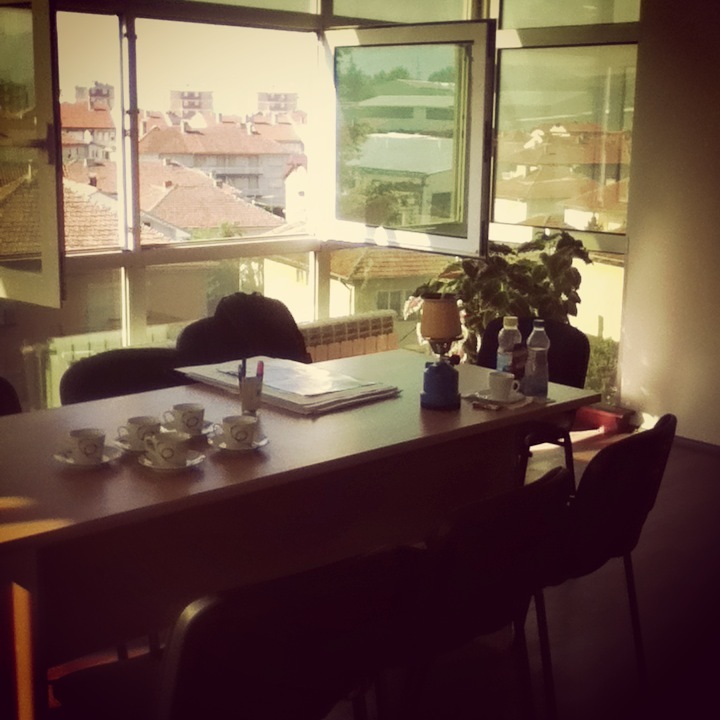 Work here (and truly everywhere) is all about relationships, and the way you build relationships in Macedonia is over kafe. The women that I drink coffee with every morning were my very first friends, and I love to start the day with their laughter and to hear the mixture of Albanian and Macedonian languages. After coffee, I spend my time in a variety of ways: either A) working directly with my colleagues for project-related activities B) planning the curriculum for my next English class, or sequences for the yoga class C) working on my Peace Corps committee work for the Environmental Working Group or the Volunteer Support Network, or D) helping other volunteers with their projects or committee work (for example helping to interview applicants for this year’s Girls Leading Our World camp). I take a break for breakfast at about 10:30 or 11 am (most people here eat their first meal at this time), either returning home to make a sandwich or going to a nearby restaurant with coworkers for my favorite dish, the pita submarine. In addition to my usual projects, I also usually have meetings or training related to the Peace Corps or my work at the Municipality. My workday at the Municipality ends at 4 pm. I return to my host family’s house to relax and grab a snack before going to the gym, going to language tutoring, or going for a run. Whenever I tell people that I am going for a run, they usually look at me a bit quizzically, and either warn me that there are wild dogs around or ask me if I am worried that the wild dogs will attack me. Of course, I was really worried when I first started running, and while I still give dogs – especially sheep dogs – wide berth, I feel comfortable with my running route. Now that the weather has become more pleasant, I also see other people out for a walk or bicycle ride. I also love going to the gym. One of my friends at work invited me to go with her, and I was excited to have a gym buddy to work out with. I knew that there was a gym or two in town, but I heard that it was mostly only men who worked out. My friend’s neighbor works out at the gym too, and took us under his wing. There are women who go to the gym, but we are few and far between. I have found that the guys who regularly go to the gym are welcoming toward us, but there are also those few who simply stare or leer at us awkwardly. After working out or finishing language tutoring, I go home or visit with my site mate to recap our days or to discuss some plans for new projects and activities – or I drop by a friend’s house for dinner. I have found that I am incompetent at cooking meals over a standing gas canister, so if I eat dinner at home, it’s usually another sandwich or a salad. And then? I wrap up any outstanding Peace Corps related work, check and respond to e-mails, Skype with friends and family, and then get ready for the next day. When I applied to the Peace Corps, I thought that I would be cooking my meals over a fire, or living in a hut in a village that has no internet or cell-phone service, and that my workplace would be in the fields. Among many Peace Corps volunteers there is a skewed perception that in order to really be a PCV, you need to placed in areas of extreme poverty (which certainly do exist in Macedonia). In reality, volunteers are sent to developing countries in all stages of development – we go where there is a need, and where we are invited to serve. I am incredibly grateful to be a volunteer, and to be living and working in Macedonia. It is a beautiful country, with warm and welcoming people, and it is my hope that I will be able to give as much to them as they have given to me.